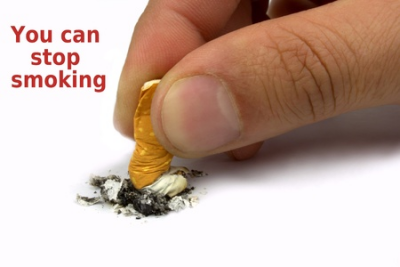 Do you need to change your smoking habit to avoid serious health problems now and in the future? You might be feeling stressed and anxious, but feel you can't give up smoking because that's how you cope with stress? Is that a familiar vicious circle? It's an important, conscious decision to give up smoking forever, even if you're not sure how you're going to do it. I CAN HELP YOU STOP SMOKING. 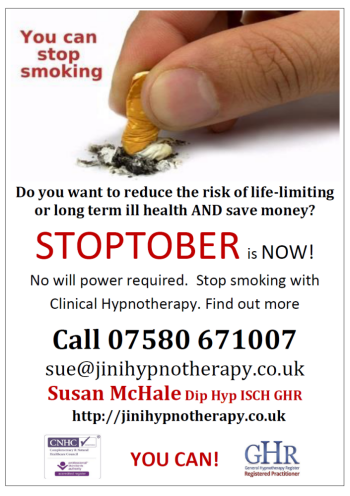 How does hypnotherapy help you to stop smoking once and for all? Once the subconscious mind understands, through the process of hypnotherapy, that to smoke is a threatening danger to your survival and wellbeing, it will overrule any other inclinations. It is not a matter of will power, neither yours nor mine. It can be quite forceful because the primary role of the subconscious is to be ready to direct you in the 'here and now' in order to keep you well and make sure you survive. It simply won't be overruled when it concerns your very survival. And smoking is a serious risk to health. In most cases it requires only a single hypnotherapy session, the cost of which is £150. For the average smoker you will recoup this cost in two to three weeks and after that it's all savings! After 1 year Your excess risk of coronary heart disease, heart attack and stroke has dropped to less than half that of a smoker. After 5-10 years Your risk of stroke has declined to that of a non-smoker. After 15 years Your risk of coronary heart disease or pancreatic cancer is now that of a person who has never smoked. Copyright © 2016 Susan McHale, all rights reserved. Use of any content whatsoever without prior written permission is expressly forbidden.